With a high predicted for Saturday, October 25 of 92, it hardly seems as if fall is upon us. But my calendar says so, and the fruits and vegetables in the stores mostly agree. No. Of course not. Wouldn’t dream of it. But I did serve some cornbread on the side. Preheat an over to 375. Brown the sausage and drain the grease. Cut “lids” off the pumpkins, holding the knife at an angle of about 45 degrees. Reserve the lid. Enlarge the hole by cutting about 1/2″ from the inside edge, holding the knife straight up & down, and scoop out all the guts & seeds (save the seeds, spray with olive oil & sprinkle with salt, then roast them). Divide the sausage, rutabaga, fennel and mushrooms evenly and mix together. 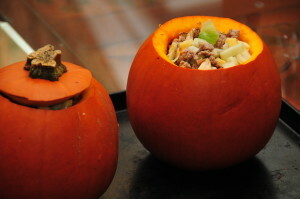 Place the mixture in your pumpkin. Sprinkle a little Kosher salt on top. Replace the lids and bake for about 2 1/2 hours, or until a thermometer inserted into the stuffing reads 165 degrees. Warning: the pumpkin skin will get DARK. This is OK. If you want, turn your oven down to 350 after about 2 hours and cook a little longer. For an additional challenge and even bigger bragging rights, make your own sage sausage!